Well, that was a welcome surprise! A good win and some great flowing football, topped off by three good goals. When we got to the ground we heard the news that Bertrand was missing, possibly injured and was being replaced by Sam McQueen. Not the end of the world, but the formers experience counts for a lot in the games we really need to win. The other thing pointed out to me was that the Penalty Spot at the Northam End was on a darker square of grass and had obviously been relaid after Harry Arter's slip on Sunday. As well as Bertrand/McQueen there was one other change with Shane Long coming in to start ahead of Jay Rodriguez. Crystal Palace were coming into this game on the back of a great win at the Premier League Champions elect, Chelsea last Sunday. On top of this, it was Palace's fourth straight win. 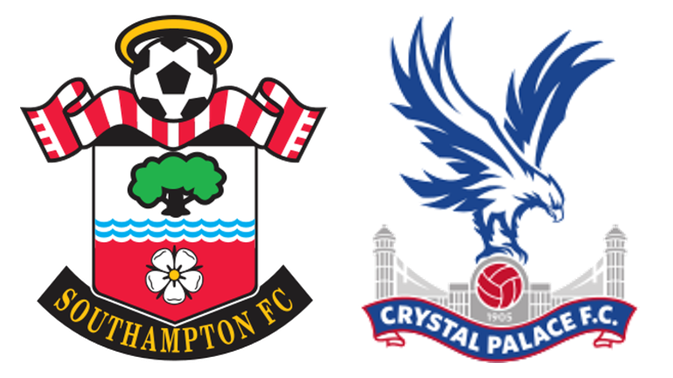 Saints were on top from the start and Shane Long had missed the target three times, before the Palace No.28 hit the base of the right hand post, with Forster standing rooted to the spot. This reads like a Long put-down, but it isn't. There is no denying that he needs far too many chances to score, but he offers so much more to the team than that, with his general harrying of the opposition defence and the ability to bring others into the game. Although Saints were well on top for the first 25 minutes, it wasn't until another great cross from Cédric was met by Redmond rising above the Palace defender and heading down at the far post, that Hennessy was forced into a save. Palace began to get the upper hand after this and looked pretty formidable with Townsend, Puncheon and Zaha playing just behind Benteke. Stephens certainly had his hands full with the big Belgian, who turned him and got a shot away, only to see Yoshida block it. This was followed by a piledriver from Zaha, which hit Romeu and went behind for a corner. Saints were struggling to contain Palace now. On 31 minutes, the inevitable happened and Zaha started a move, cutting across the edge of the area to get away from Romeu, passing to Puncheon, who in turn sent an arrow like pass to Townsend. Benteke was rushing goalward, between Yoshida and Cédric. Townsend crossed from the far right of the Saints area, Benteke met it with his left foot. Goal. 0-1. Shortly after, Benteke headed a Townsend cross from the left down, but Zaha hit it high and wide into the Chapel stand. Saints then started to get back into the game and there were two penalty appeals in short order, one of which was a clear handball by Schlupp. The Saints players appealed as one and when I saw a replay of it on TV later, it was clearly a nailed on penalty. Only Roger East didn't see it that way (Video ref alert). The players were also incensed when a shoulder charge from Milivojevic floored Long, but Mr. East just waved play on. These three incidents in rapid succession might just have had a bearing on what happened next. Right on 45 minutes, Davis shoulder charged Zaha and nicked the ball from him and passed it to Redmond, who controlled it with his chest and with his left foot, shot through a group of four Palace defenders and the goalkeeper into the net. Goal! 1-1. Fat Sam was livid. After the match and conveniently forgetting the incidents immediately before, raged about the injustice of it all. He really is a grade one plonker. So, all square at half time and the Saints team talk could be more positive. Saints started the second half in a positive fashion, with Redmond having another excellent game, beating Ward and his cross from the left was met by James Ward-Prowse, another having an excellent game, but his shot was cleared off the line by Sakho. The rebound fell to Cédric, but he shot wide. Straight down to the other end and Puncheon hoisted the ball over to Townsend, who could only hit it just over, with the ball landing on top of the net. Back up to the other end (are you getting the end to end picture?) and Tadić had a clever through ball chipped wide by Long. Davis won the ball from the goal kick and then managed to get around Sakho, but was immediately dispossessed by Kelly. From this, the ball found it's way back to the Saints byline and the cross was headed down by Benteke to Kelly, who managed to hit the post from maybe no more than six yards out. Saints then had a glorious chance when Shane Long beat the offside trap and was one on one with Hennessey, only for the goalkeeper to bat the ball away. The goalkeeper was very busy for the next few minutes, with Saints in the ascendancy. First he dived to turn a drive by Romeu from distance around for a corner, then he dived to his right to catch a header from Yoshida. Hennessey did have to rely on Sakho to block a shot from Davis and then Delaney stopped a shot from Davis again. Davis collided with Delaney and there was a lengthy break, while the Saints Captain received treatment. Eventually the pressure told in the 83rd minute, when Redmond crossed from the left and Stephens shot across the face of the goal for Yoshida to prod the ball home. A well worked goal and it was now 2-1. It didn't stay that way for long, as just two minutes later Cédric went racing into the box and passed sideways to Ward-Prowse, who scored. 3-1 and just five minute, plus time added on to go. There was still time for a final piece of drama, as Fraser Forster tipped over a Jason Puncheon free kick, but it was too little, too late for Palace. A good win, with excellent performances all over the pitch. The team is growing together. Tadić, Redmond and Cédric, all looked great and I have been particularly impressed with JWP these last few weeks. For what seems like years we have watched him flattering to deceive, but now he is the player we hoped he might be. I am giving this to Nathan Redmond, who was everywhere and looked like a man possessed. Who said he would never make a striker?